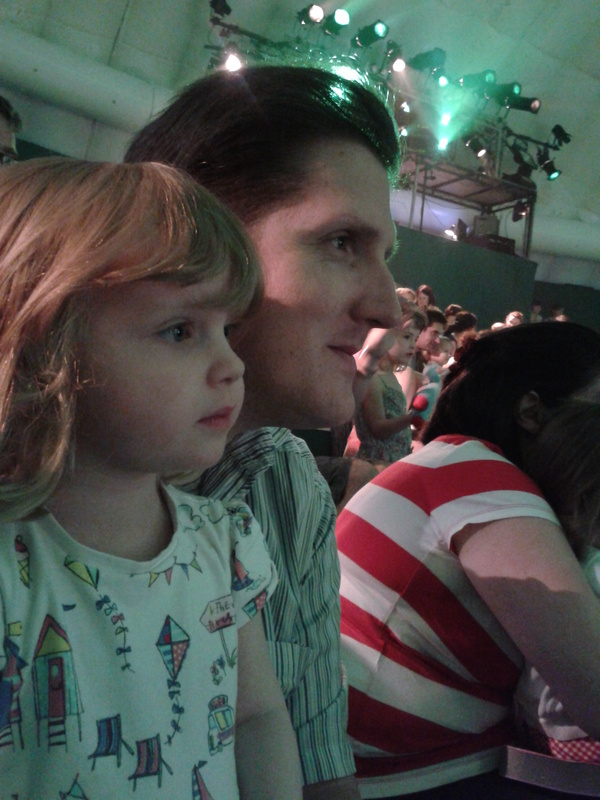 Enthralled by In The NIght Garden Live! It’s a good thing, and one of the great advantages of social media, that people have posted videos of their trips to In The Night Garden Live on YouTube so that V can see it again and again. “I want to watch Night Garden on your phone mummy”, is a near continuous request at the moment. 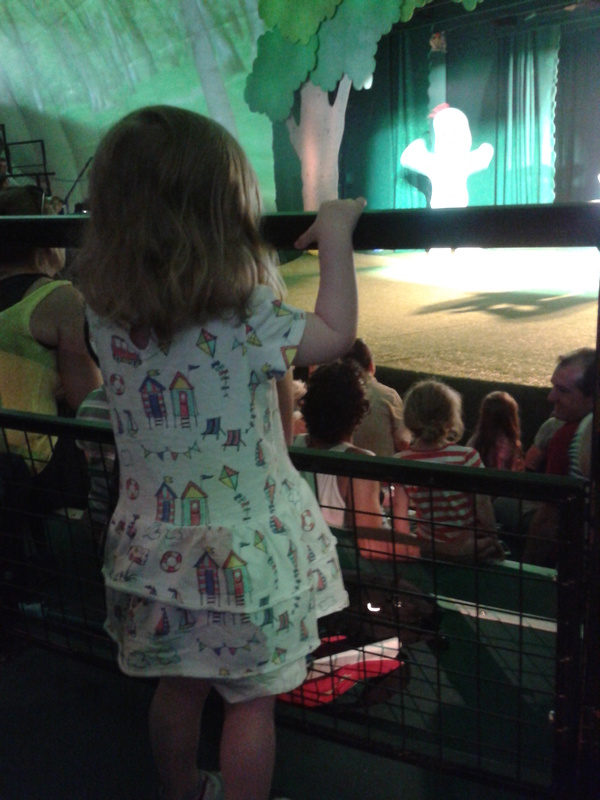 We first visited the show nearly a year ago when it was a then 16-month-old V’s first trip to the theatre. When we heard it was back for this year, booking tickets was a no brainer as she had loved it, plus, during the past year, we have discovered that it is only at the theatre that she will sit still for longer than five minutes! The show is the same as it was last year, which doesn’t matter a bit for little ones, who for the most part seem happy to watch the same episodes of programmes over and over again anyway. The basic story is that Iggle Piggle loses his blanket and, after a bit of a search involving the Pontipines, he finds it again! The children see all the characters that they know and love – Iggle Piggle, Upsy Daisy, Makka Pakka, the Tombliboos and the Pontipines which all appear either as costumed characters or puppets. There is also a Ninky Nonk and Pinky Ponk while the Titifers and Hah Hoos appear as projections on the ceiling and back wall. The perspective that you get on the telly is reproduced well. When Makka Pakka first appears, he (????) is huge, but when he is in a scene with the larger Iggle Piggle, a smaller puppet is used so you really get a sense of each character’s size in relation to each other. It’s all very clever and well thought out and intelligently brings to life the world that is so familiar on the telly. There are also very high production values that sadly are sometimes skimped upon in other shows because it’s “just for children”. She couldn’t sit still any longer and just had to get a closer view! The most important thing though was that V loved it again and talks about it from the moment she wakes in the morning – and I do mean that literally. Parents who may not be as concerned about whether or not Iggle Piggle finds his blanket, will get their enjoyment and entertainment from watching the look of sheer wonderment on their children’s faces at the magic of it all and the amazement at seeing their heroes right in front of them. The show is 50 minutes long which I thought was about right. V did get a bit fidgety in the last 15 minutes but it was really because she wanted to stand and watch – and dance – and luckily there is plenty of space between the rows to allow children to do this. Certainly, a 27-month-old V was even more engaged with it all. Last year’s shouting out and saying hello and goodbye to the characters turned into a complete running commentary of the action. It always amazes me how she can talk for ages about the same thing – perhaps a career at News 24 beckons! Find out more about the showdome.